Today I called home in the morning as usual but this time everyone sounded more than a little worried. While I was talking to my mom, my dad was on the phone with the Coast Guard. They Had recevied a lot of calls from people who were worried about the tsunami. They were calling to check my position to see if I was in any danger. They were pretty concerned and said that I was right in the middle of where they were expecting the tsunami to go. 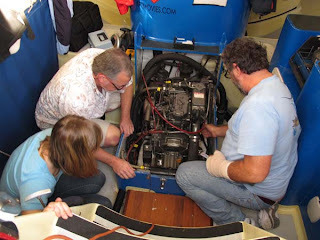 The guys at Commander's Weather assured us that I would not be in any danger but it was a good reason to just go over everything on the boat since the boat is not heeled over as much as she was earlier this week. I went over the boat and made sure everything was ready just in case, but in the end, I didn't even get a big swell. 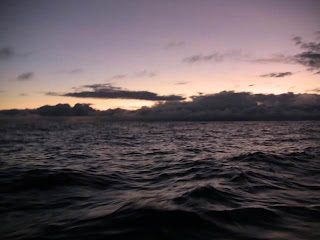 I am almost three thousand miles off shore so it wasn't very likely for me to have felt anything at all. With the tsunami behind me now, my main worries are my genoa that's chafing on the pull pit. But even that isn't a serious problem. All I need to do is pull out my sail repair kit and put a patch on it. Other than that every thing is going extremely well out here. Last night my wind started to die down quite a bit, and I was starting to get a little worried but it picked right back up this morning. 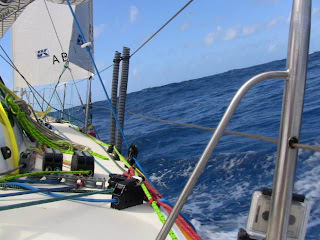 The wind has shifted around more from the east, so I'm at a very comfortable point of sail and making great time! So I'll be keeping Chile in my prayers and also praying that the tsunami doesn't do too much damage where ever it does hit. Getting a lot of calls and emails about Abby and her safety in light of the massive earthquake in Chile. She is well and has not experienced anything out of the ordinary. 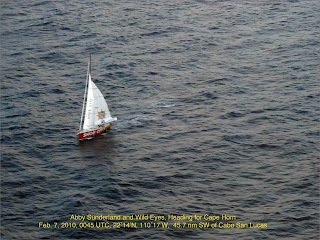 Her current position is 16 19S and 123 26W heading south at 6.5-7 knots. Winds are light out of the NE. The ocean depth is so great where she is there is very little chance that she will experience even an unusual swell. The effects of a Tsunami are felt when the wave action reaches shallow coastal waters. In fact being near the Southern California coast, we may be in more danger than her! It was a bit alarming waking up to concerned calls from the Coast Guard but we do appreciate all of your concerns. Abby will blog later on today and will be checking in more frequently today in light of the situation. Our prayers are with those who have been effected by this catastrophic earthquake in Chile. Just a note to let you all know that Abby officially crossed the equator at 3:00 this afternoon. She will blog tomorrow and let you all know how it went. She was busy trying to catch up on some sleep! Sitting in the cockpit at sunset. I had planned on crossing the equator yesterday. But the weather had other plans. Right now I have hardly any wind and the little bit that there is is coming from the south, so it has been pretty slow going. I am 6 miles away from the equator, so I should be crossing it pretty soon! I've been pretty busy out here lately. I ran my watermaker for the first time yesterday. The water that was coming out, though not salty, tasted and smelled horrible. Due to the heat here, the little life forms that live in salt water had died and begun to really smell! I had to clean out the pre-filter, run it for a little while, and then it was working nicely again! I also needed to change my fuel filters as they had gotten pretty dirty. 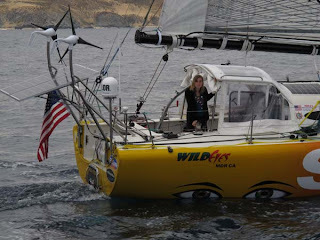 So after a lot of crawling around under the cockpit in the very back of the boat she is running strong which is good, because when there isn't enough wind or sun for my wind generators and solar panels that is how I charge the batteries. Boiling hot and covered in diesel, but things are ship shape around here and I'm headed in the right direction , so all is good out here! I'll let you all know once I've crossed the equator!! Today has been a really good day. It started out much like all the others, 90 degrees while pouring rain and rolling around not going anywhere. I'm officially in the doldrums, and they are not fun. But today the wind picked up to 20 - 30 kts and it made today one of the best I've had in awhile! I also got to do a Skype call with the family! It was really great to see them all again. Little Ben was sleeping, and a few of the others weren't around, but it was good to see Katherine and have Zac there to tease me. We're working on recording some video so I can do a video blog, so I should be able to get something up here soon. The past two days I have hardly made any progress. Luckily, the dead patch is really small, only about 100 miles long. I've got some great wind now, but I'm not sure I'm out of the area with no wind. The wind often picks up for a few minutes here and there, this time its lasted quite a bit longer then usual, so I'm keeping my fingers crossed and hoping to doesn't die down. It's been so hot recently that I'm really looking forward to getting down into colder weather. 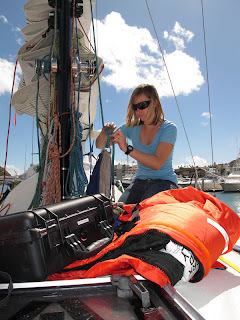 Of course, I'll probably be wishing that I was back up here in the heat once I'm down in the southern ocean! I think I'm safe from the squid now. I haven't had any more in a few days and I don't get so many flying fish either. I have seen a few birds around and was really surprised to see them so far offshore! Happy Valentine's Day everyone!! It's quite a nice day out today as long as I stay outside. Down below is pretty miserable but outside there is a nice breeze so it isn't as bad. I was getting really hot earlier today so I dumped a bucket of salt water over my head... it was much colder than I had expected! I have been making good progress the past few days and I'm actually ahead of my updated schedule now. I haven't discovered any jumping spiders so far, so I'm still very much single handing, except for the occasional flying fish. But seeing as fish don't have hands, I may not be completely alone but am still single handing! I've been able to make about 170 - 180 miles a day so I should be down at the equator soon! I have to think of something to do once I get there! There isn't a whole lot of wind right now, but Wild Eyes is moving along nicely. I slept outside last night. It was so nice compared to being down below and the cockpit floor was even more comfortable than my bed! 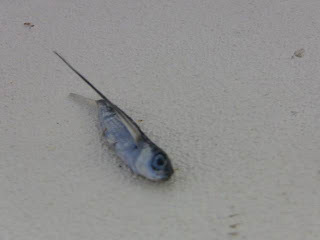 I would have slept very well if I hadn't been so worried that a flying fish or squid would land on me. It was really very worrying because the squid and fish keep seeming to land around the same spot, which was entirely too close to where my head was! Hope you're all having a good Valentines Day back home! There hasn't been a lot of excitement out here since my leaving Cabo san Lucas. The first few days where nice and sunny, but then it started to rain and its been pouring ever since. I've had a lot of squally conditions. Nothing too big or bad, but enough to keep me from getting much sleep at night with the frequent sail changes. There is a low pressure system not far to the south of me that I have been trying to avoid by passing it to the west. I found out this morning that there's another boat about 300 miles ahead of me that is hove to getting smashed with 50 knots. There's a possibility I could get into it some time tonight. I might not, but just in case I went over the boat to make sure everything is ready, so now I've just got to wait. I've had a few more squid that have decided to join me on my trip recently which I thought was a bit weird as I hadn't seen any the last few days before getting to Cabo. Other than the occasional squid I haven't had a whole lot of interesting wild life. I did see dolphins pretty often while I was close to Marina del Rey and I did see a few whales far off the day I pulled into Cabo but that's about it for wild life. I'm back out on the ocean and happy to be here. I was really beginning to miss it! I left Cabo around 10:00am on Saturday. Things are going really well now. I'm on a nice beam reach and making great speed. I've had good wind all day and I should be able to make up for lost time quickly if it keeps up. Cabo san Lucas was a lot of fun even though there was a lot of work and everyone was working hard. The people there were all great and I'm looking forward to getting back there in six months. Thanks to Capt Chris, Capt Kevin, and Capt Dave Ive got a good fishing line now and I'm hoping to catch something soon! Having my AIS working has been great even though its not a vital piece of equipment and I could just use my radar for spotting ships. It does make things quite a bit easier. I spent last night in a pretty heavy shipping area but didn't have a ship come within 3 miles of me all night long. It's been a lot easier getting settled in this time than it was when I left Marina del Rey. Leaving was a lot easier and after being out one day I'm pretty much all settled in. 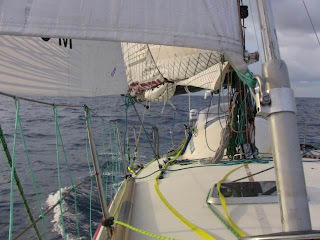 This whole side track has been a good experience; all the way from dancing around a restaurant with the party host, who happened to be a Mexican guy in a funny suit, to all our new friends, to the hours spent up the mast and in the hold working. Even though it wasn't intended that way, I'm looking on the past as a sea trial. I found a few problems, and now they're fixed. This time, I'm ready for the world! 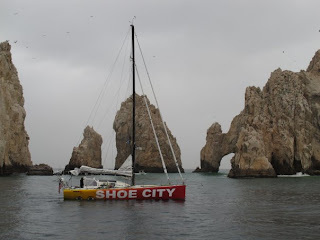 After Abby having a great shakedown cruise to Cabo, here is what we accomplished over the last 3 days with much help from Jeff, Pilot Bill, Myself, Abby's father Laurence, Cabo Captain Chris, many cabo locals, and Abby herself. A special thanks to Enrique, Norma, and especially Augusto of IGY Marina Cabo San Lucas for a warm welcome in which they went out of their way to make our stay short and sweet. and several other things I can not remember now since 4 of us each spent over 50 hours working on Wild Eyes over the past 3 days. It is now all in Abby and Wild Eyes' hands. 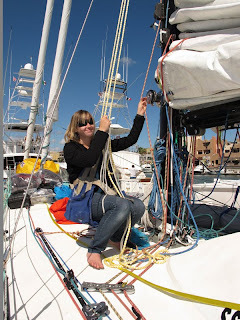 Abby will now depart Saturday morning and I am looking forward to seeing her in her next port of call, Cabo, after sailing the worlds' oceans. I'm sitting here in our hotel room with no Internet connection. I've been trying to get a blog up but I can't seem to find anywhere to get online here. I'll probably have to send this from my boat tomorrow. Everything went really well getting in here at Cabo. I got in Tuesday afternoon in the pouring rain. The past three days I had been living in swimming suits because it was so hot! I was a pretty funny sight coming in bare foot in my foul weather jacket and board shorts! It was good to finally get in here. My dad and the guys that came out from my team came out and met me while I was out a few miles. Everybody here has been so helpful. The guys had planned on coming out in a little panga to meet me but a local boat owner here, Chris, heard that I was headed in and offered to come out in his big power boat with my dad and the team to guide me in. Since then, Chris has offered to do whatever he can to help. Everyone that hears about what has happened and what I'm doing here seems to be so excited and eager to help out. The work on the boat is going as well as can be expected. We couldn't get a whole lot done on Tuesday because it was getting late and raining pretty hard, but six o'clock this morning we were all hard at work and luckily the weather has been sunny and warm all day! I met another young sailor today, Emily, and it has been really great hanging out with her a little. So few younger people sail and even less girls do. Its nice to get to know people who are doing similar things and talking to someone who knows what it is like. The dock master of the marina was very excited to have us here and is letting us stay in an apartment over the office so we can be closer to the marina. 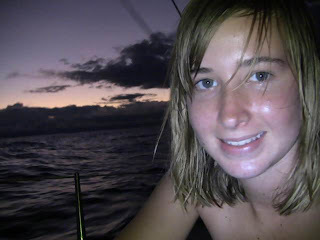 Instead of making the two hour row out to the far end of the anchorage Emily is staying with us tonight. There are a ton of good pictures! I've just got to find someplace to send them from. I will send them as soon as I can! Things have been going well today. I've had some nice wind for a good part of today though its just starting to die down. I got a bit of a shock last night. I saw a ship for the first time in at least four or five days! I just saw it on my AIS and it was 86 miles away, but still, I guess I'll be seeing a lot more now that I'm close to shore. I should be into Cabo sometime tomorrow afternoon. From the comments it looks like there is a bit of confusion as to how this affects my attempt. I'm not going to be a non-stop stopper. 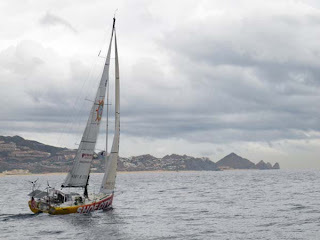 One of the rules of a circumnavigation is that you have to cross the equator twice and since I'm north of the equator still, I can just re-start from Cabo. This will mean that my voyage will officially end back in Cabo. Also, with the timing and weather windows and all that we had been concerned, but with my weather router's guidance we will take each leg one leg at a time. I almost certainly won't go south of New Zealand but will go north via the Tasman Sea. My mom sent me a list of questions from you guys, so I'll do my best to answer a few of them. 1. How do I wash my clothes? I don't get to wash my clothes very often, but when I do I do it in a bucket. 2. Do I use Sailmail? I don't use Sailmail. Sailmail goes through the Single Side Band high frequency radio. The coverage for that system isn't very reliable in the southern ocean. I have Inmarsat through my Thrane & Thrane Sailor 250 unit. That is how I get online, write blogs, check email, and all that. 3. How do you carry enough water? I have a thirty gallon water tank and a water maker so I can fill my tank whenever I need to. 4. What kind of cameras do you have on board? Most of my cameras were sponsored by Gopro. They're really awesome little things and we have them set up in water proof cases. They are also called point of view cameras becasue you can put them on your head or your chest and film what you are doing while you are doing it. I also have a Canon video camera (thanks to Samy's Camera) that isn't mounted for video blogs and pictures. 5. How do I keep from falling over board? I wear a harness whenever I'm on deck and if I were to fall off, Alan Blunt, the rigger that was working on Wild Eyes, set up a system for me to get back on board. If for some reason that didn't work I have a hand held epirb (or PLB) that I keep with me all the time when I'm outside. This was loaned to me by Dr Daniel Chen from Microwave Monolithics. Check out his link on my Sponosr's page. His design of PLB (personal locator beacon) is used by a lot of government officials because they are so powerful and reliable. 6. What kind of music do I have on board? I have 50 gbs of music on my ipod, so there's a little of every thing. 8. Do I have an anchor? Yes, I have two anchors. You never know when you might need one! I think that answers just about everything for now, but please feel free to ask anything and see the Ask Abby page on my web site for more answers to other questions. I'm still working on figuring out my cameras but I'll try and get some pictures on the blog soon, maybe some video too!